Anglo-Dutch portrait painter born in London of Dutch parents (originally Cornelis Jonson van Ceulen). He perhaps trained in Holland and he settled there in 1643, but he worked mainly in London, where he had an extensive practice. Johnson was at his best when working on a fairly small scale, showing a sensitive gift for characterization. He painted in a straightforward but sensitive Dutch manner sometimes indistinguishable from that of Mytens. After 1632 he came under van Dyck s influence, but in Holland he adopted a more Dutch manner, closer to that of Miereveld. 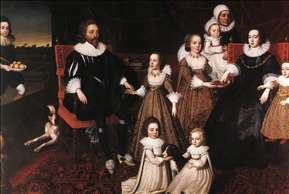 See more details about "Sir Thomas Lucy and his Family"